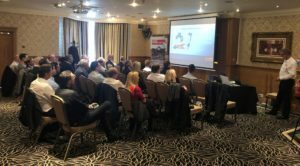 Over 30 guests attended the first 2019 North West IDE Regional Meeting, hosted by ECY Haulmark. 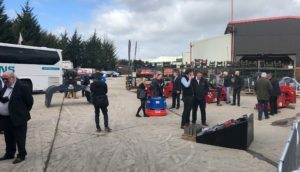 Rik Yarwood opened the meeting with Adrian McLean FIDE with a visit to the yard where there was a large selection of demolition attachments and a demonstration of the latest Oilquick Excavator in operation switching between attachments . The delegates returned to the meeting, where the first speaker was Mike Kehoe MIDE of C&D Consultancy who asked the question “Can traditional demolition learn from explosive demolition?” within his presentation which started a lengthy debate between delegates. Next up was Joshua from Andun whose topic “Temporary Works”, showed some old cut and pull techniques being used recently at the grounds of Tottenham Hotspur where a 300t beam was pulled over successfully. The third presentation from Mark Mates MIDE of Hitec Demolition covered the topic of “Emergency Demolition” in which he has become a specialist in fire damage properties and all the risks involved. The final presentation was from Mark Bryant MIDE of JBV Demolition spoke of “Demolition Past, Present and Future” , another subject that was heavily debated at the end. A 2 hour event turned into 3 1/2 due to the quality of the presentations and the questions and points from the floor from a good audience . Overall the event was a great success and ECY have agreed to sponsor this on a annual event. The IDE would like to thank all involved in arranging and presenting at this event and we look forward to another North West Regional in due course.